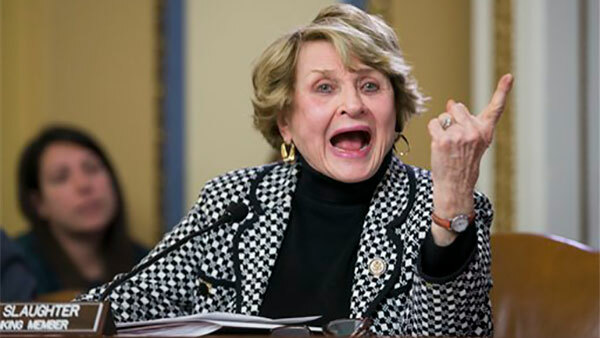 WASHINGTON -- Veteran Congresswoman Rep. Louise Slaughter died Friday days after falling in her residence, her top aide said. The 88-year-old lawmaker had been the first woman to chair the House Rules Committee and was her party's top member on the panel when she died. Slaughter had a degree in microbiology and was originally from Harlan County, Kentucky, and her soft, twangy accent always seemed out of place for someone representing a district around Rochester, New York. But she was repeatedly re-elected -including a narrow victory in 2014 - and was the longest-serving member of Congress from New York when she died. Her death creates a vacancy at the top of the Democratic side of the Rules panel, which sets the terms of House floor debates. It's likely to be filled by Rep. Jim McGovern, D-Mass. When Slaughter was first elected in 1986, she ousted GOP Rep. Fred Eckert after running a campaign advertisement in which Peggy Say accused him of refusing to "speak up" for her brother, kidnapped Associated Press reporter Terry Anderson. Say and Anderson were both from the Rochester, New York, area. Anderson, the AP's Middle East bureau chief, had been captured the year before by Islamic militants in Beirut, Lebanon, and was not released until 1991. Associated Press writers Andrew Taylor and Kevin Freking contributed to this report.